You expect to find a lot of things when you walk down Broadway Street in Cambridge – some trash, a Brazilian market, a funeral parlor or two. But you do not expect to run across a small, warm, restaurant with a roaring fire and excellent farm to table food. I made my first trip to Bondir on what was only their 9th day open to the public, but the good-natured crowds mingling in the firelit foyer made it seem like the place had been there for years. Rather than give off the air of a sleek, scene-y new kid, Bondir already feels like a much-loved neighborhood spot. As soon as you enter, Chef Jason Bond, Manager Patrick Gaggiano, and the entire Bondir staff make you feel like a welcome guest in their home, not just a patron at a restaurant. Many of the decorative touches in the cozy space – their harvest table and mirrors, for example- came from their friends, and details like mismatched – yet beautifully detailed- plates contribute to the friendly atmosphere. Mr. Gaggiano is always present, making use of the skills he honed as a child while performing his favorite chore- clearing and setting the table- while also answering questions from diners and offering suggestions or just friendly conversation. And then, there is the food. Far from an obligatory sourdough roll, Bondir starts you off with truly inspired bread. Staff baker Lan Lam makes all of their bread in-house daily, and it rises window- side by their fireplace. The assortment we had was Sour Cherry Walnut, Bronze Fennel Seed, and Sepia. They were all flavorful, but the clear star was the Sepia, made with squid ink. Chewy, dense, and rich, it was only due to rapidly waning willpower that I was able to keep from asking for another helping. One of my favorite features at Bondir is that they offer half portions of their entrees. If you aren’t that hungry, a half portion would suffice for your whole meal, but it’s much more fun to order several half portions and try as many dishes as you can eat. Farmhouse style tapas, if you will. I started with the Bloody Butcher Heirloom Grits with Vegetable Mignardises. The name Bloody Butcher comes from the ruby red color of the grain used for the grits, which has been harvested on the state line of Georgia since the early 1820’s. The grits themselves were tender but not runny, but the vegetables were my favorite part of the entire night. 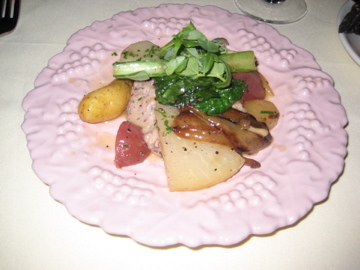 Black radish, gill feathered turnip, Jerusalem artichoke, pickled mushrooms, kholrabi, and yukina savoy were all cooked and seasoned perfectly. 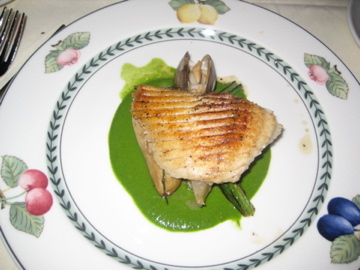 This is the kind of vegetarian dish that you serve to staunch carnivores to shut them up. The Tagliatelle alla Macellaria with Black Truffle had subtle layers of flavor in the pork and lamb ragu, and my dining partner’s Scituate Skate Wing and Pea Green Broth was seared and seasoned perfectly. By the time we were done with dinner, my bulging stomach was ready – almost hoping- to be underwhelmed by dessert, as it is at most restaurants. But the Roxbury Russet Apple and Cranberry Tart with Port Creme Fraiche had us raving – the combination of sweet and tart, not to mention the perfectly flaky pastry crust, will bring me back just for dessert. 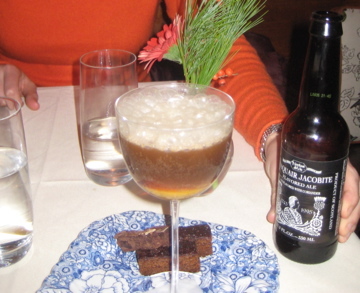 I’m still talking about the Traquair Jacobite Coriander Beer Float with Futsu Squash Puree and Salted Caramel Ice Cream. Not only do I love a drink that masquerades as a dessert, but the squash puree in the beer epitomizes what Chef Bond is going for – combining the traditional and modern to prepare honest, flavorful food. 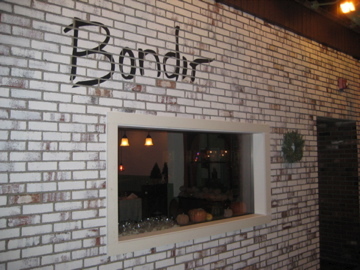 I’m happy to have had the chance to eat at Bondir already, because I have a feeling it’s going to be nearly impossible to get a reservation soon. While Broadway Street isn’t exactly a culinary thoroughfare, there is plenty of competition nearby- Tupelo, Hungry Mother, and Oleana, to name a few – but it seems clear Bondir can hold their own. Run over this weekend, try as many half portions as you can manage, and don’t leave without getting dessert.